One of the things I love about living in Australia is the fact that we celebrate Christmas in July like our friends in New Zealand and South Africa. July is the middle of winter and the coldest month of the year because we all know that seasons are opposite in the Southern hemisphere. So a whole lot of us decided to celebrate Christmas in July and called it Yulefest, because honestly it is a bit too hot in December to have mulled wine, hot roasts and puddings. And what good is a Christmas celebration if there is no Gingerbread involved? We are gingerbread fiends in this house (well, mostly me!) but the rest of the gang is catching up. When I found out that Nespresso was about to introduce a new permanent Grand Cru called Envivo Lungo to their amazing arrays of coffees and that it had gingerbread notes, I could not contain my excitement. Especially when asked to collaborate with them to create a recipe that would do justice to Envivo Lungo’s full bodied aromatic woods and gingerbread notes. With ginger and spice as my muse and rich caramel coffee tones guiding my visual palette, I set out to create an ode to the Christmas in July celebration. 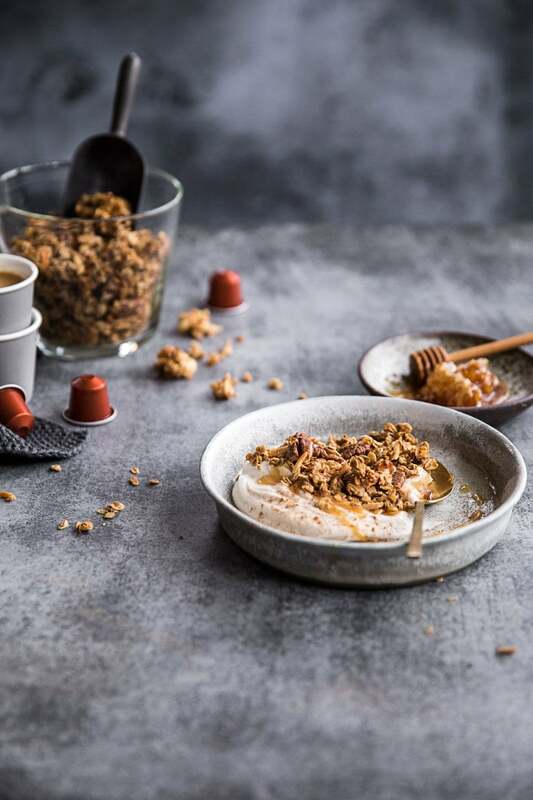 I created an aromatic and delicious Gingerbread Granola infused with this new coffee with plenty of crunch, texture and warmth to liven up cold dreary winter mornings. 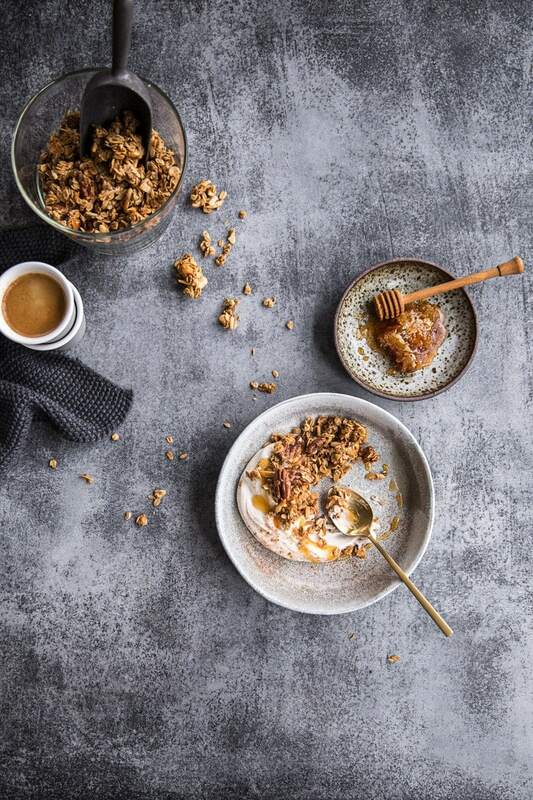 The combination of coffee and spice goes especially well with a creamy coconut yoghurt making this a fabulous breakfast for the grown ups. And it makes an amazing little gift for your favourite coffee loving humans. 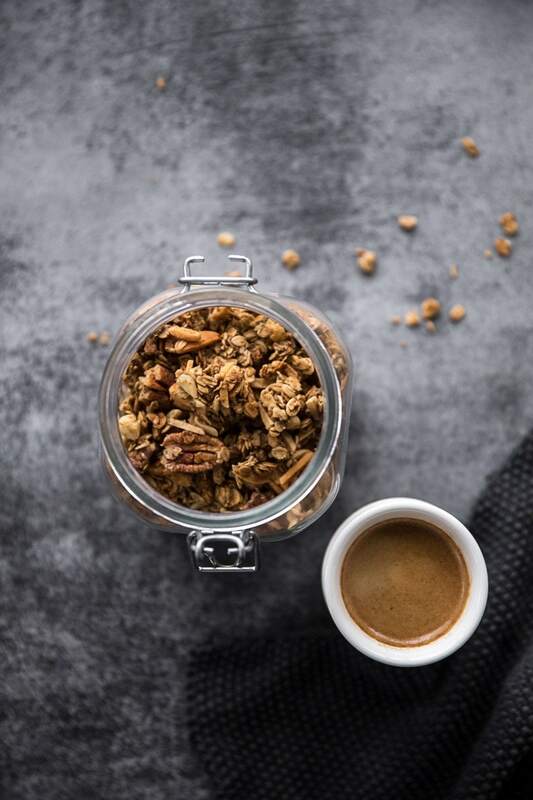 In fact, I love it so much, I just break the clusters off the granola (yes, this recipe makes perfect little granola clusters) and snack on them with my mid morning coffee. Utterly addictive! Pre-heat oven to 150C (conventional) or 130C(fan forced). Line a rimmed 28cm x 20cm base measurement baking sheet with baking paper. 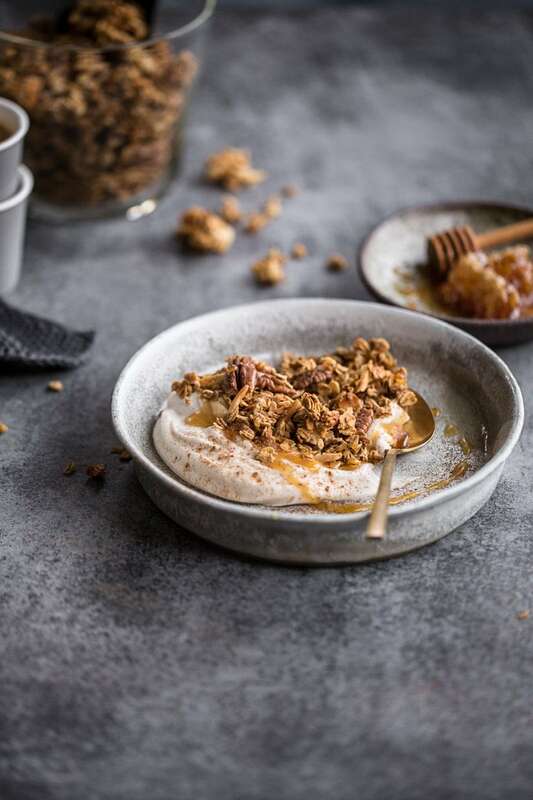 Place oats, pecan nuts, almonds and macadamias in a large bowl. Place butter, maple syrup, golden syrup, ground ginger, mixed spice and salt in a small heavy bottomed saucepan. Heat on low until butter is melted. Mix well. Remove from heat. Add butter mixture to the dry oat mix. Add 40 ml espresso (discard the rest or use it to make a coffee based dessert sauce). Mix well. Spread granola mix on prepared tray evenly. Press down with a wooden spoon. Bake in pre-heated oven for approximately 35 minutes until fragrant and starting to turn golden. Remove from oven and allow to cool completely. When completely cool, granola can be broken up into rough clumps and bottled in glass jars with sealed lids. Granola will keep in a cool corner of your pantry in the lidded glass jars for up to 2 weeks. To serve, scoop a generous dollop of coconut yoghurt onto a plate. Top with a cup of granola. Drizzle with honey or maple syrup and enjoy. Make it vegan by swapping regular butter with cocoa butter or coconut oil. Make it gluten-free by swapping oats with toasted buckwheat. If it is possible to run the prepared granola through a dehydrator (43C for about 2-3 hours) before cooling and packaging, it will ensure crisp and crunch as this recipe has “liquid coffee” which tends to make the stored granola a bit soggy after storing for a couple of days. Take care to remove the granola from the oven immediately when done. 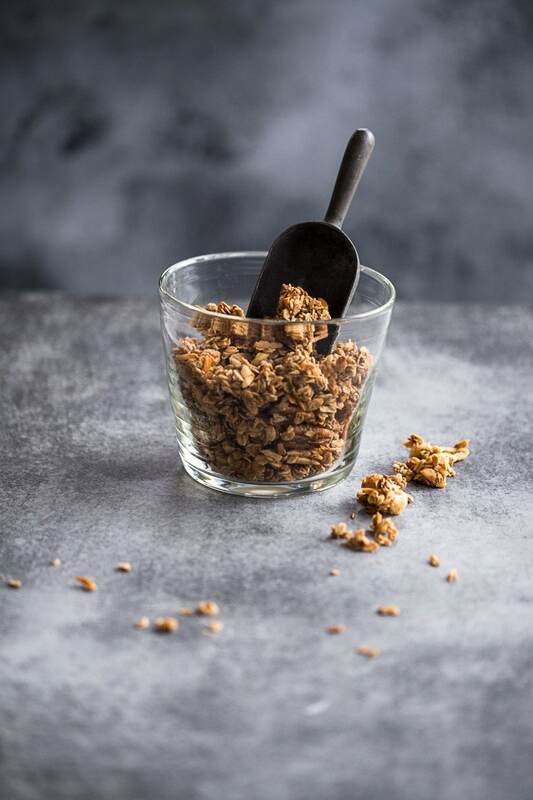 After cooling the granola for approximately 20-25 minutes, store it in an air-tight glass container while the granola is till crunchy. This will ensure that your granola stays crisp. 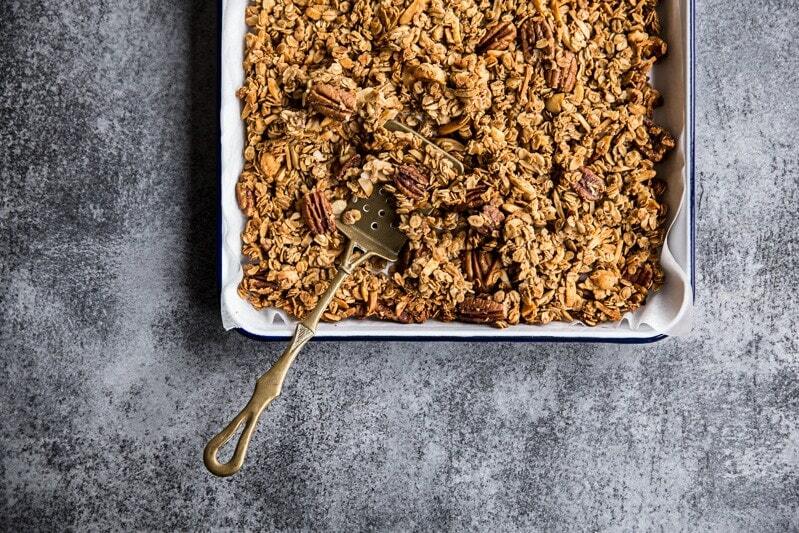 The quantity is enough for 6 serves, but if you end up storing the granola for over 10 days and you find it has softened a bit, refresh it by crisping in a pre-heated oven (150C) for 5-8 minutes, then cooling and storing. Although you will miss the subtle gingerbread notes of the Envivo Lungo, you could substitute this ingredient with a high quality espresso – quality is key to making this recipe work. 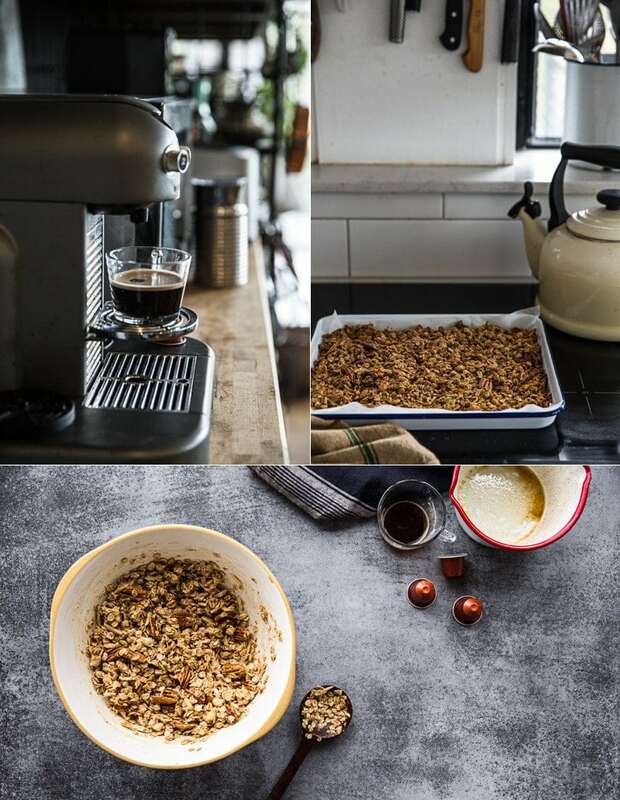 Note – This post is sponsored by Nespresso, the recipe was created in collaboration with them. Thoughts, words and feels are entirely mine. I have a few questions. What is golden syrup, what spices are in “mixed spices”, and do you use the espresso made with water or use the powder! I love also the addition of coffee in the granola 😀 Does it make the milk – when used – become a little “latte”? What an awesome flavour combination! I bet this granola is highly addictive. 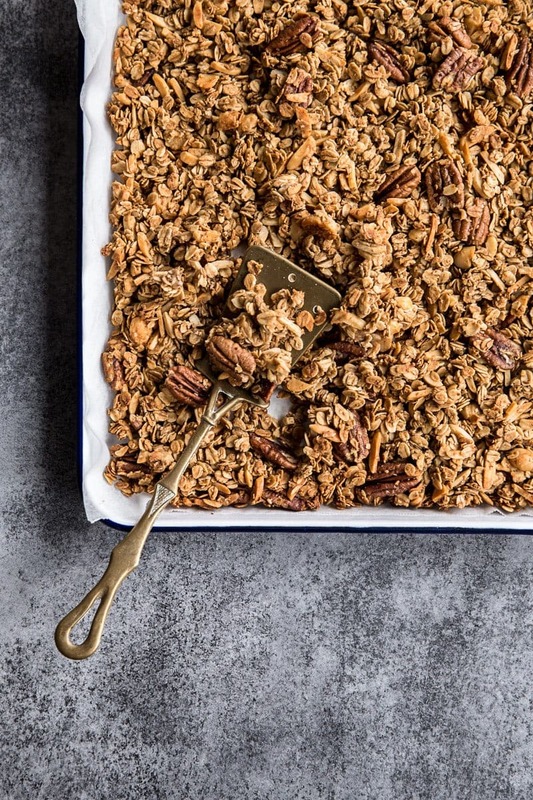 I’m not usually a granola fan but this sounds delicious! Oh yes this is good! I love granola and a coffee version sounds amazing. Love the pictures on this and the dishes you have are lovely. This sounds amazing!!! Love that it has coffe in it! Thank you for answering my question, Sneh! I am making this tomorrow morning! Yum! Just a question about using toasted buckwheat – is it a simple replace oats with buckwheat? Or would I need to prep the buckwheat beforehand?